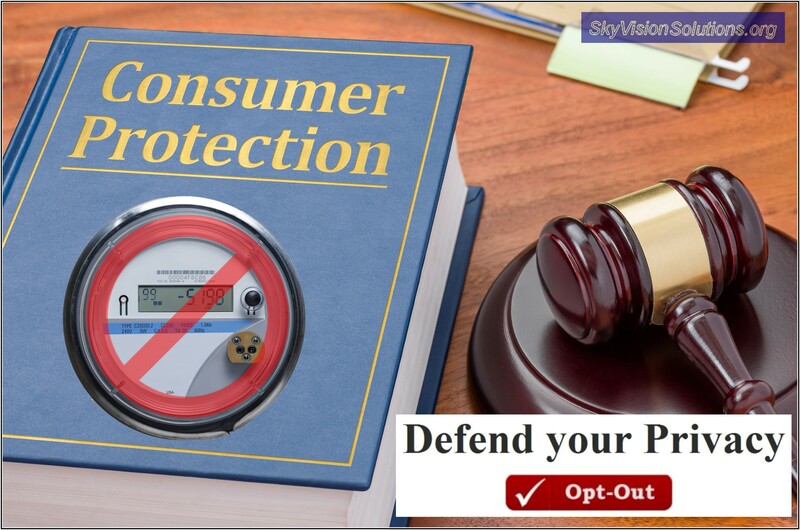 For those consumers who oppose utility smart meters, it should not be necessary to “opt-out” of a program for which there never was an “opt-in.” This is especially true when there are no clear benefits for participation in a program that exposes the consumer to significant risks and also involves the violation of personal rights. The above statements, although positive in one sense, are astonishing for how someone could think it legal or ethical to charge a consumer any fee in order to avoid having one’s rights violated. Nevertheless, the article may be of value to consumers and activists still fighting to achieve reasonable ‘opt-out’ policies within their local jurisdictions. What follows are selected quotations from the published law analysis and where I provide emphasis with bold font in some instances. Please note that I purchased the copyrighted published article and am providing these selected quotations in the public’s interest for non-commercial purposes. Others should not feel at liberty to liberally quote this posting without having purchased the published article. In addition, the full published article will provide more complete context than what is provided below. Despite the narrative maintained by the authors of the published law analysis that there are societal benefits to smart meters, which is quite questionable as to what they might be, the analysis arrived at the clear conclusion that all consumers should have the right to be provided a reasonable ‘opt-out’ mechanism. The above reality presents an extraordinary burden for consumers desiring to preserve their privacy rights in the face of smart meter installations. In some instances, they must either move house and home or otherwise pay high fees to maintain a traditional usage meter. It is incumbent on governments and utilities to provide a reasonable ‘opt-out’ mechanism. In some jurisdictions in the United States which currently allow no smart meter “opt-outs,’ such as for Commonwealth Edison customers in Illinois and utilities in Pennsylvania, given the analysis provided in the referenced article, there can no longer be a rational or ethical basis for a government/PUC or utility continuing to dismiss consumer privacy concerns by not providing a smart meter ‘opt out’ mechanism, one which is accompanied with little or no fee. In another example, the City of Naperville, Illinois, only provides a non-wireless alternative smart meter ‘opt out’ option which still intrusively collects granular data every 15 minutes. For other jurisdictions that charge high ‘opt-out’ fees that are considered as “penalties” for consumers attempting to preserve their privacy rights, they need to reevaluate the basis for those fees. This article contains material which is represented as being used pursuant to the Fair Use Doctrine under 17 U.S.C. 107 and is presented in the public’s interest for non-commercial purposes. Although the major portions of this article are comprised of selected quotations of a copyrighted document, SkyVision Solutions represents that the manner in which the materials were rearranged, remixed, or otherwise altered in sequence qualifies this article as a “derivative work” under 17 U.S.C. 103. SkyVision Solutions does not imply any exclusive right to the preexisting material. This entry was posted in Smart Grid, Smart Meters, and RF Emissions and tagged Invasion of Privacy, Law Analysis, Opt-Out, Privacy, Smart Meters. Bookmark the permalink. I seem to have no option, my electric company says I can not go back to Analog. Well, hopefully you can work with others in your area to get the rules changed on people being able to refuse having a smart meter on their home and still receive electrical service. One of my goals at this website is to make the information available to help other consumers make that possible. This is a electric co-op we had no choice but to use them for our electric company. This is also a rural area so I need to reach out to others in the co-op to see how they feel about smart meters. Chances are, most don’t even realize there is anything negative about them. Any payment to avoid harm (in this case privacy invasion) is extortion, plain & simple. I don’t agree with this Opt out constant set of statements being stated by all Electric Power Companies as it’s Extortion. I never Opted In for a dopy Electric Microwave A.M.I broadcasting and receiving machine in the first place. Please stop saying it’s a Smart Meter. This is a stupid statement and only a sales gimmick used by these C.E.O’s and their Ilk to try and dumb-down the public to the fact that these so-called Smart Meters are the bees knees. I say…. There was never actually an ‘opt-in Mechanism.’ It’s all been Bullying of the Highest degree by I allege to have been and still seemingly to be corrupt Electric Power Companies aided and abetted by weak and complicit governments to screw more and more Tax Dollars from the public, simple as that. This is where the rubber will meet the road for many americans that are not EHS symptomatic.